Who is to Blame for the Venezuela – Colombia Border Crisis? In an effort to restore peace and order along the Colombian border, the President of Venezuela, Nicholas Maduro, has declared a state of emergency. 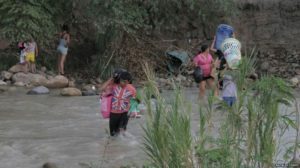 Border crossings between Venezuela and Colombia have closed, martial law has been enacted in border regions, and Colombians living in border towns in Venezuela illegally were given 72-hours to pack up and leave their homes, many fleeing back across the river to Colombia. This decision comes after smugglers and border police engaged in gunfire last week, leaving three soldiers wounded. The identity and nationality of these smugglers is still yet unknown, an investigation is underway. One other individual involved in the attack was arrested, he is a Venezuelan citizen. President Maduro has accused Colombian paramilitary individuals of having a link to Colombia’s former president, Alvaro Uribe. However, Colombian President, Juan Manuel Santos has suggested that the smuggling problem is rooted in Venezuela, not Colombia. For many years, Venezuelan citizens have used the border to smuggle gasoline and other Venezuelan goods into Colombia in order to sell them at higher prices to Colombian citizens. This smuggling practice is facilitated by Venezuela’s government subsidies which allow Venezuelan citizens to use these subsidies to purchase food, cosmetics, and gasoline that they later re-sell in Colombia, which has resulted in these items becoming scarce inside Venezuela. However, President Maduro attributes the scarcity of these items to mismanagement and not to smuggling. The black market economy originating in Venezuela has been the source of income for Venezuelan families living along the border of these two countries for some time. The state of exception instituted by President Maduro has been the subject of international criticism. Venezuelan army soldiers have marked the cinder block homes of these evicted families with a red letter “D” indicating demolition. The declaration of a state of emergency allows Venezuelan soldiers to search businesses without a warrant. News outlets around the world have condemned these actions. The families with only a 72-hour eviction notice, have been forced to walk across knee-high river waters with their belongings, leaving the oil-rich country where they established a life behind. There have been more than 1000 Colombian citizens that have been deported since the law was implemented. 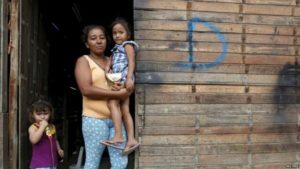 Although President Maduro blames these citizens for Venezuela’s smuggling and violence problems, these families have fled poverty, famine, and violence and moved to Venezuela hoping to benefit from the country’s natural resources labor. More than 800 Colombians live in this border region. President Santos has already pledged to providing government subsidies for these families and helping these them find a home in Colombia. The effects of this border closing have already been seen in both countries. In Colombia there is a scarce supply of gasoline, leaving many motorists competing for fuel to power their engines. In Venezuela, the trade halt has left many poor families that relied on this trade without means to support their families. Although President Maduro is satisfied with the halting of the smuggling practice, this border closing has done anything but address the root of the smuggling problem, which originates in Venezuela. Sandra M. Ortega is a 2L at University of Denver Sturm College of Law and a Staff Editor on the Denver Journal of International Law and Policy.